gray box in the upper right corner. without the Site Administrator's Assistance. 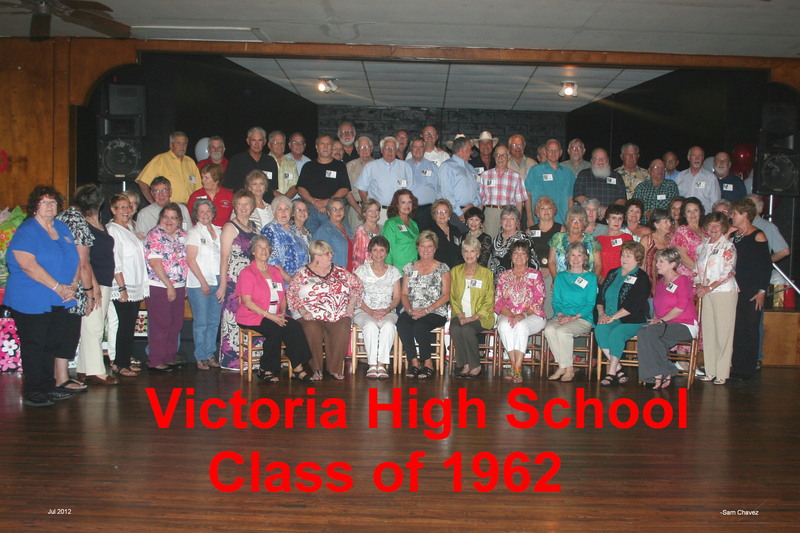 Welcome to the Victoria High Class Of 1962 website. This is a website for the exclusive use of the classmates of VHS. To join this site, click on "Classmates Profiles" at the top left margin. Find your name, click on it and follow the instructions. Please use this site to notify the Class Reunion Committee of any changes or updates to your contact information. This is important as the updates will be downloaded to use for mailing labels to send out notices about our upcoming Class Reunion. This site was created to help promote, celebrate and reconnect with classmates. Even if you have never attended a reunion or kept in contact since high school, your participation is essential for it to succeed! Please take the time to update your profile and add photos! 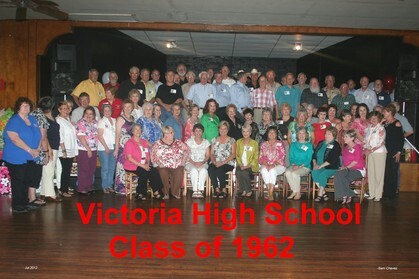 Click on the Reunion link for more information about our 50th Class Reunion on July 6 & July 7, 2012. PRIVACY NOTICE: All contact information (address, phone number, e-mail address) entered into this website will be kept confidential. It will not be shared or distributed. Your contact information is private: When someone clicks on your name, the only contact information they will see is your city, state and whatever information about yourself you choose to put on your Profile. You can grant permission on your Profile for your address and phone number to be seen. Your e-mail address can only be seen by the Webmaster and Site Administrators. All messages are sent internally thru the website by using the contact box at the bottom of your Classmates Profile page. If you don't want search engines to find you, make sure you check the appropriate box on the bottom of your profile page. MEMBERSHIP DISCLAIMER:All memberships may be revoked at the discretion of the Webmaster and Site Administrators. The privacy and security of all registered members will be considered a priority for the purpose of invitations, admittance, denials and revocations. Please remember to keep your password confidential to protect the privacy of our classmates. Please use good taste and judgment when posting photos. Please send any announcements to me that you would like to have posted on the website. All material will be screened for appropriate content and language. Please take a look at the classmates that we do not have addresses for, and notify me if you happen to know or can find their address. Stay tuned for additional information. I am still learning how to develop this site so please be patient. Please scroll all the way down this page for additional information.